AMSOIL riders know few products compare to the AMSOIL Formula 4-Stroke® PowerSports (AFF) Synthetic Motor Oil. Its 0W viscosity rating and ultra-low -60°F pour point offer maximum cold-weather protection, ensuring easy cranking, excellent cold starts on frigid winter mornings and quick post-startup protection. It also provides superior wear protection due to high levels of anti-wear additives that protect pistons and bearings, while its SAE 40 viscosity delivers a strong lubricating film for excellent protection in hard-working engines. 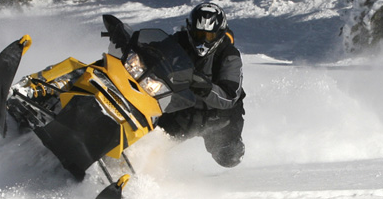 An issue affecting many hard-charging sleds is oil foaming. When engines reach high RPMs, churning engine parts can cause the oil to foam, inhibiting the oil’s lubricating ability, increasing heat and wear. AMSOIL Formula 4-Stroke Power Sports Synthetic Motor Oil inhibits foam for maximum performance and protection. Ideal for your four-stroke sled, this product also provides superior protection for ATV’s, UTV’s and other powersports applications. To learn about the different options you have to purchase this product click here.